A pall of gloom descended on earth on the 27 April 2017, taking away from our midst our dear doctor to the heavenly abode. I am reminded of the words of Pandit Jawaharlal Nehru on the passing away of Mahatma Gandhi. “The light has gone out of our lives and there is darkness everywhere. I do not know what to tell you and how to say it”. Similarly in the case of our most revered doctor Ramanathan. He lived his life for genuine purposes, accomplished to become a legendary figure. He was a person of strong mind with exemplary character, pleasing manners and affectionate disposition. Never would he resort to vilification campaign and always commanded respect from all quarters. Born in 1925 he began his clinical practice in the year 1953. He was truly committed to his profession and established the creditable practice for more than 50 years! I recollect how in those days he used to be busy all the time with family visits. That was a time when the family doctor concept was still in vogue. A family doctor in those good olden days was literally a member of the family and cared about patients beyond the treatment of their diseases. We sadly see this concept fast disappearing in today’s scenario. Dr. Ramanathan was always driven by a passion to serve the poor and the unprivileged class. During his family visits, he used to treat many poor patients free of cost earning him the name as the people’s doctor. Unable to cope with the barrage of requests for home visits, he started a nursing home in the year 1973. The celebration of the golden jubilee of his illustrious medical career in 2003 was a testimony to the long and Sustained medical service he had been rendering to the society. What set him apart from others of his generation, according to me, was that during his time when most people in his profession thought of making it big and becoming famous overnight, he did a yeoman service to the society at large. He was a thorough gentleman, always polite and tolerant which made him a well-known and well-liked doctor. Gradually, through his medical profession, he entered the field of social service. The saying “A busy bee finds time for everything” applies perfectly to Dr.Ramanathan. He was very closely associated with the Indian Medical Association (IMA*) in which he had held an important position for many years. Dr.Ramanathan was one of the founding members of the ‘Sree Kanchi Sankaracharya Free Clinic Society in Calicut. This Society was established in 1971 for charitable purposes and for the benefit of all persons irrespective of caste, color, creed, religion or language. The doctor was actively involved in its various activities including free medical consultation and giving free medicines to the needy. He also served as the president of this esteemed organization for many years. He was actively involved in activities beyond his profession serving the society at large. He was also the founding member of Brahmin Service Society (BSS) in Calicut doing service to poor the downtrodden. He was the secretary of BSS and did commendable services for the deserving and disadvantaged which are unforgettable! BSS is currently giving pension to deserving people every month. 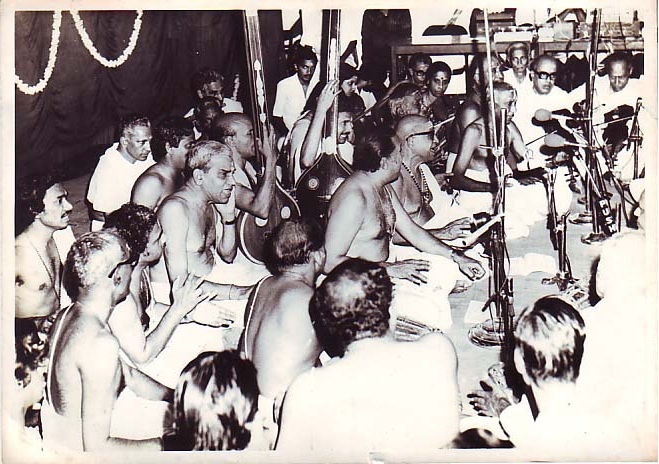 Dr.Ramanathan was one among the few key persons behind planting the seeds of the tree called Saint Thyagaraja Aradhana Trust and today we are all reaping its fruits in the form of wonderful music we get to hear during the Aradhana celebrations. Kudos to that great visionary. He delicately maintained a balance doing justice to both his medical profession and sociocultural activities. He could handle two assignments in tandem – the clinic and promotion of music. Life is like riding a bicycle, to keep your balance you must keep moving he used to say. Dr.Ramanathan remains immortal in the minds and hearts of Rasikas, practitioners of music and common friends because of the significant contributions he has made by playing a pivotal and pioneering role for the cause of music in Calicut. His passing away is undoubtedly an irreparable loss and severe blow to one and all of us. We have indeed lost a leading light and true patron of music. On a personal note, he was my family doctor since 1957 and ever since I have been his great admirer. He was one of those who lived humbly, never seeking any praise or acknowledgment for his immense services and contributions – a true karmayogi. Am sure the Lord has blessed him and placed him in a very high position in heaven as well from where he will continue guiding us. ‘Fate can only pluck the flowers, not its fragrance.